For one day each year, thousands of Arlington parents come together online. They’re poised in front of the keyboard, waiting for the clock to flip to 7 a.m.―and the Arlington Department of Parks and Recreation (DPR) summer camp registration process to officially open. Then it’s a race to get their children registered for the camps they’ve had their eyes on or to shore up daytime activities for specific weeks during the summer. This year, there were a record 5,039 registrations on that first day, with 2,980 of them coming within the first hour. At the center of that multifaceted and highly valued process is Chemin Brown, DPR’s registration and administrative services support unit manager. Having spent her entire professional life working in parks and recreation―beginning at 14 years old for her home community of Alexandria and for the past decade in Arlington County―Brown is passionate about the work that she does and the pivotal role camps and classes play in the lives of parents and children alike. 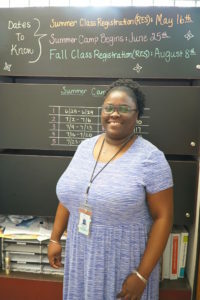 Brown was recently recognized with the ACES (Arlington County Employee Successes) Award for ensuring the first day of summer camp registration ran smoothly. She sat down to discuss her work and how she manages such a cornerstone of DPR’s programming. Q: Share a little about your role in the Department of Parks and Recreation. A: I oversee four administrative assistants and three registrars in the registration office. My goal is to make sure we have seamless registrations as parents come for summer camp registration and other programs and classes. I answer complaints and questions that we get from the public on issues they may have during registration. Q: How do you manage the summer camp registration process and what are the challenges associated with it? A: You must be very detail oriented. If you’re not, a lot of things fall by the wayside. I do a lot of checks and balances just to make sure the website is working correctly, making sure that staff can log into the call center on that first day. If there are issues, I report those to DTS. There’s a lot of checking in the WebTrac system to make sure that classes appear on the website and classes from previous sessions aren’t there. When parents are upset because their child is waitlisted for a camp or a class, I try to give them other options as a backup, listening to their interests and making related suggestions. I’m a single parent myself so I know how the need for child care works. I’m able to sympathize with them, understand what they’re going through, and realize how important it is—the need to have activities for your children. Q: Walk us through your workday on the first day of camp registration. A: I get here anywhere between 6:15 and 6:30. Usually, I stop off to get refreshments for staff because they’re waking up very early. I hand out folders that I prepare for all staff with the class or camp catalog, a problem log sheet in case they come across a customer who is having an issue, and any age exceptions or age overrides that we get from the programs. Then, I log into the call center to make sure that everyone who is helping us that morning is able to log in and assist with calls. I work with our camp programmer to make sure the call center is open so at 7 a.m. we can take those calls. Then it’s just nonstop. Once 7 a.m. hits, it’s on. I get a lot of customers who want to speak to a manager on that day…they want something resolved right then. What I can resolve right then and there, I resolve but most others require documentation and research of the issue they are experiencing. I then let them know that it’s the first day of registration, and I’ll get back with them as soon as possible. It’s a lot of documenting—putting it into a spreadsheet so I can follow up and close that loop. The day goes from 6:15 to about 5:30. Sleep is a must the day before! Q: How do you feel your work makes a difference in the lives of parents and children? A: When we have customers who call and need activities for their children, I find joy in helping them. I understand having two little ones myself how important it is to have them involved in activities. Instead of just being at home, they want to be a part of something, in a class or in a facility, and enjoying the many programs that we offer. Arlington County is small, but even with all the promotion we do you’d be surprised how many people don’t know about all the programs we offer. Q: What other programs and initiatives have your worked on for DPR in the past year? A: I’ve been a part of DPR’s internal customer service committee, where we review different practices for external customers and our internal customers. I also worked with the DPR team and APAH [Arlington Partnership for Affordable Housing] on getting people an easier way to apply for fee reductions―people who may not have known about them. We’re working to streamline that process and to make sure people in affordable housing communities can apply for a fee reduction and participate in classes as well. A: The people. For Arlington County to be so small, it’s a very diverse population and you meet people from all over, not just Virginia. You meet people from other countries, and sometimes, they’ll teach you things that you didn’t know. I had a conversation with a man who called to register for a class, and we had a conversation where he was telling me about the Civil War, and I learned a lot of things from him. I’ve had conversations with customers who have come to my office to talk about getting a fee reduction and then we’ve started talking about my plant and having a green thumb. The culture here in Arlington County is wonderful. You meet different people every day. No day is the same and I like that.